Your Xbox One does not appreciate that potty mouth, so keep it in check or you might get a time out! Microsoft may be temporarily banning users who swear while using Skype and Upload Studio on Xbox One. 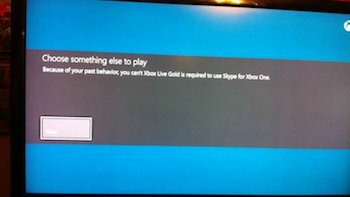 Multiple users have taken to Reddit and the Xbox One forums after finding themselves locked out of the apps, presumably after submitting content - Either uploading gameplay streams or using Skype to make a private call - which included profanity. Based on the photo above, posted by Twitter user Connor, the Xbox One tells banned users to "choose something else to play... Because of their past behavior." "I made a video and said a bad word (not really a swear in my opinion, but I do understand their displeasure - the nickname of the name Richard) and now I am not able to put Kinect videos on my uploads or upload gameplay at all," says Reddit user Macedonian Wolf. Macedonian Wolf found, upon calling Microsoft customer service, that his or her account was still "in good standing" with Xbox Live. Microsoft customer service said the company would work to lift the ban. Sure enough, Wolf was able to open Upload Studio again within 24 hours. Meanwhile, some Xbox One forum-goers are suggesting the ban may be connected to the apps' content rating: Many users claim they have successfully uploaded profanity-laced streaming content from M-rated games like Battlefield 4. As Polygon points out, Microsoft's code of conduct for Xbox Live prevents users from using profanity in their gamertags, Avatars, profiles or in-game content. The terms do not specifically mention streaming gameplay.